I’ve often heard it said that we fear dying more than we fear death. Death takes little time, but dying … it’s unpredictable and unfamiliar and can take months and years. I think we can quell our fear of dying, but not until we recognize why we fear dying. One. We’re unfamiliar with dying. Dying used to happen inside the home, with the family acting as caregiver, the home acting as the place of death. Now, it happens in a private room in a hospital or nursing home. With death removed from our common experience, it’s unfamiliar and unknown. Two. We fear dying in an unfamiliar place. Seven percent of American dying and death occurs outside of home and institution. And while most of this seven percent is produced by a tragic car accident, or random heart attack, the likelihood is that our “dying in an unfamiliar place” will not be of the tragic type. The institutionalization of medicine means that you will probably die in an institutional setting. In fact, three out of four deaths in the United States occur in a hospital or nursing home, outside of our home surrounding and outside of the comfort of our family. Three. We fear that our dying will be alone. Often – due to the expertise of nursing staff – family can often arrive for our death, but they miss the dying. If you have a loved one in a nursing home, I respect your decision. Yet, to be honest, one of the hardest parts of my job is simply walking through nursing homes and seeing all the aging in crowded loneliness. With institutional dying, we have professional caregivers who do an outstanding job; but, these caregivers are not our loved ones, farther making our surroundings unfamiliar. I think we need to remember that the true professional caregivers are our loved ones and family members. And this is perhaps the fundamental fear that lies at the heart of the problem. We think that by removing ourselves from our families (via entrance into a nursing home or retirement community), we relieve the burden; but YOU ARE NOT A BURDEN. Your dying doesn’t burden family, it’s what creates family. It allows us to love, it allows us to be a caretaker, and it allows us to let the dying die in a familiar place. 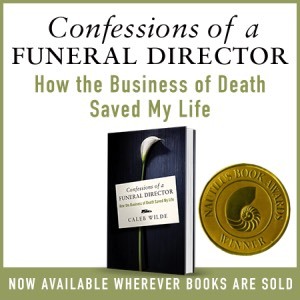 This entry was posted by Caleb Wilde on September 17, 2012 at 1:30 pm, and is filed under Dying Well, Fear of Death. Follow any responses to this post through RSS 2.0.You can leave a response or trackback from your own site.